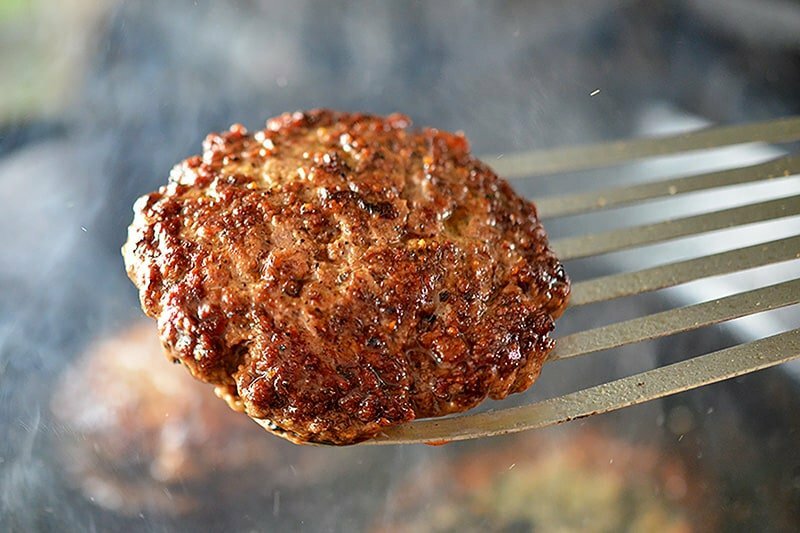 My Whole30-friendly Nomster Burgers are a healthy makeover of the popular mustard-grilled Animal Style patties from legendary California burger chain In-N-Out’s secret menu. They’re ready in 30 minutes and you won’t even have to leave your house to satisfy your fast food burger cravings! You may already be familiar with my Nomster Burgers, as this recipe was featured in the “Not Ready! Emergency Fast Food That Tastes Good” section of our latest cookbook, Ready or Not! I originally created them for my hubby, Henry, because back in college, Animal Style burgers from In-N-Out were one of Henry’s favorite road trip eats. This classic secret menu item comes with extra sauce, grilled onions, and mustard fried directly into the patty. 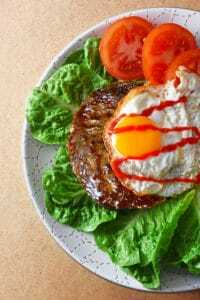 Similarly, my nom-ified ode to Henry’s favorite burger features a mustard-fried patty, but I’ve stuffed it with shallots and topped it with spicy sriracha and a crispy fried egg. 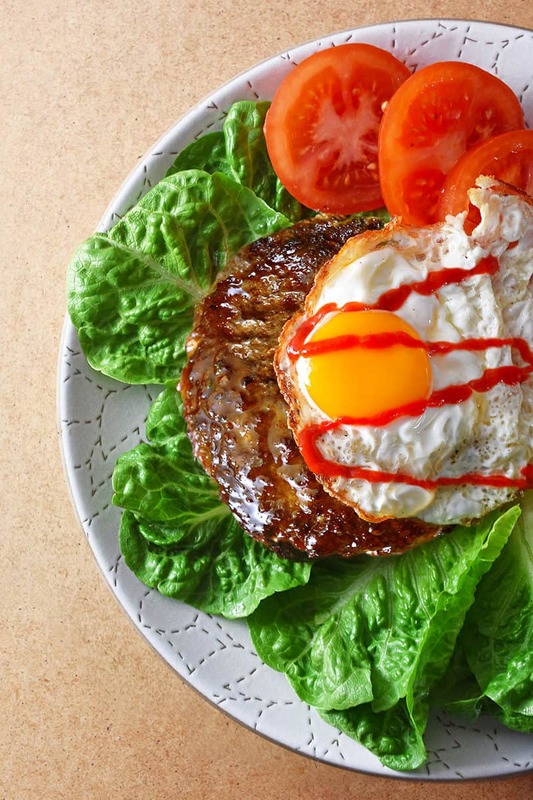 Make it and serve it “protein-style” with lettuce leaves for the bun and everyone will be smiling! I recommend 15-20% fat ground beef for these burgers. 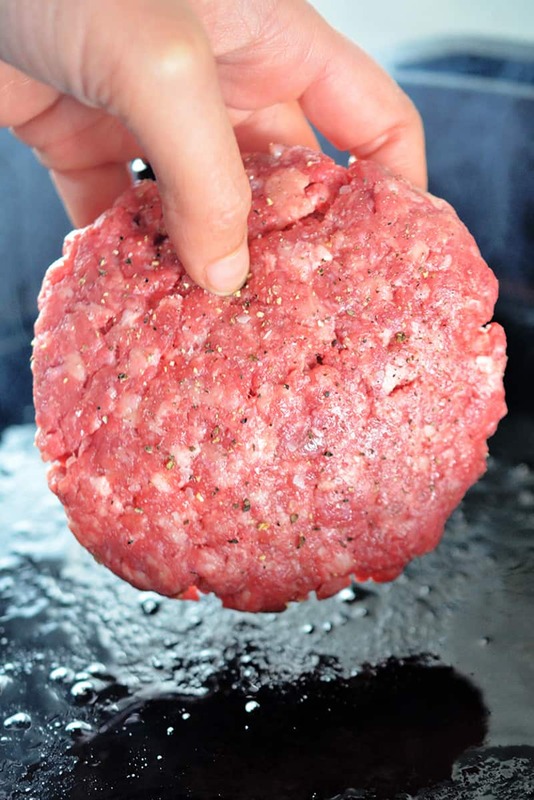 The fat gives your burgers more flavor and keeps the patties from drying out. You can definitely use ground lamb, turkey, or bison instead, but make sure the grind isn’t super lean. 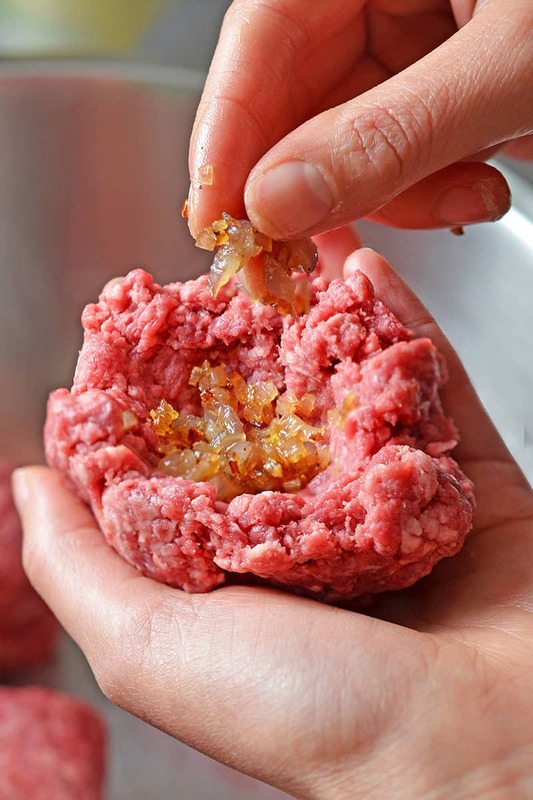 Make sure the shallots are room temperature (or colder) when you form the patties—otherwise the fat in the ground meat will warm up and the patties will be hard to handle. When I have my act together (which, granted, is not often), I fry the shallots ahead of time and keep them in the fridge until I’m ready to form the patties. If I’m cooking the patties in a hurry on a busy weeknight, I place the cooked shallots in a single layer on a plate to quickly chill the cooked shallots in the freezer or fridge. No shallots? Just use half a small red, yellow, or white onion! If you hate onions, you can totally leave them out. Your Nomster burgers will still taste great. 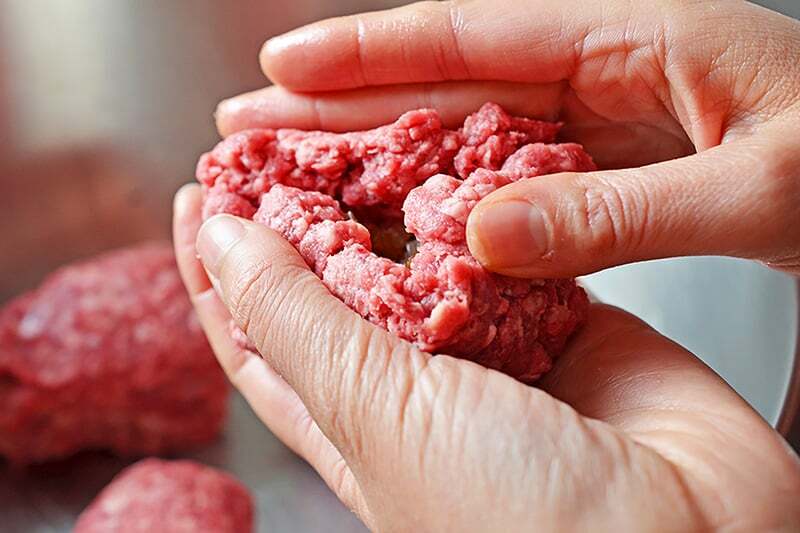 You can form the patties up until a day in advance and keep them in the fridge—but don’t salt them until you are ready to fry ’em up. Here’s a helpful article from Serious Eats that explains why salting right before frying is best. 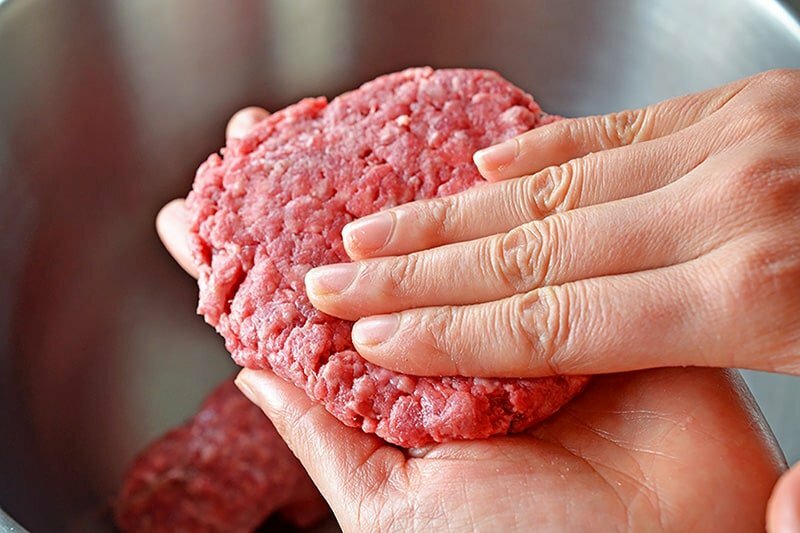 I also like to flatten the burgers to about a half-inch thickness for quick cooking. My favorite pan for frying burgers is a well-seasoned cast iron skillet because the patties get nicely browned. How do I find Whole30-friendly mustard? Whole30-compliant mustard is not super hard to find these days. Most organic brands of mustard—both American and Dijon style—are Whole30-compliant. Just make sure you read the ingredient label to make sure there isn’t any sugar, wine, malt, sulfites, or other non-compliant stuff in it. The brands I normally buy are Primal Kitchen, Organicville, and Annie’s Homegrown Organic. Feel free to use any type of Whole30-compliant mustard you prefer—or leave it off if you don’t like it! 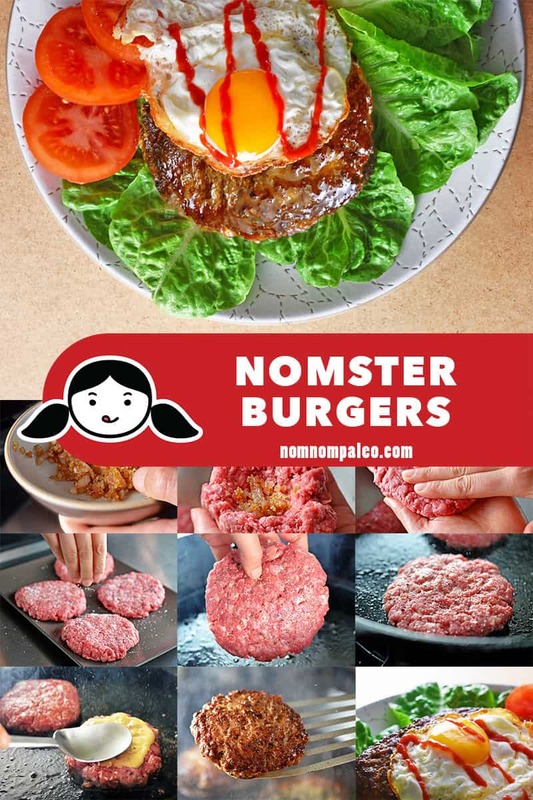 What should I serve with Nomster Burgers? Ready to make some Nomster burgers? Heat a large skillet over medium low heat and swirl in 1 tablespoon of ghee when the pan is hot. Toss in the finely diced shallots and sauté for 3 to 5 minutes or until golden and translucent. 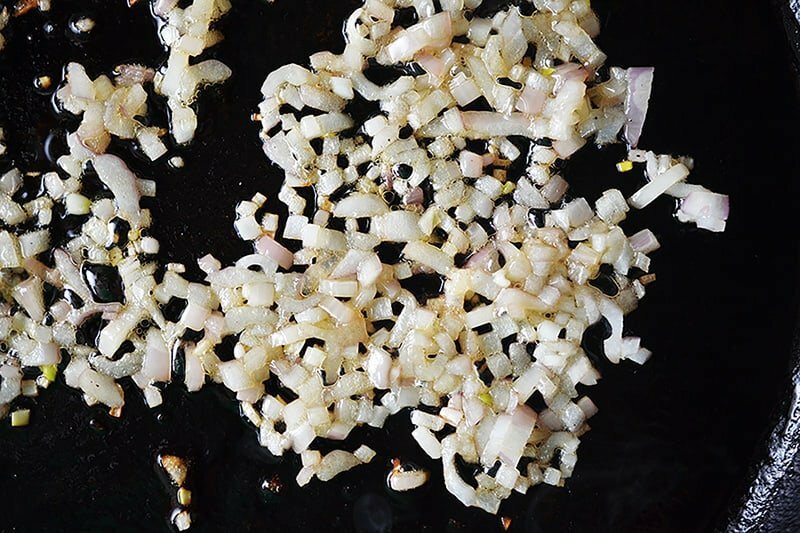 Transfer the sautéed shallots to a bowl to cool to room temperature. 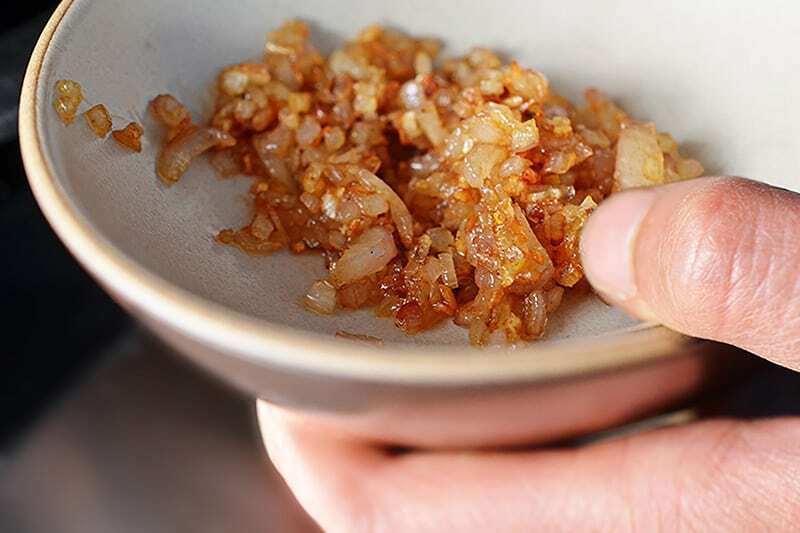 If you want to chill the shallots quickly, put them in a single layer on a plate and pop them into the fridge or freezer until you are ready to form the Nomster Burgers. 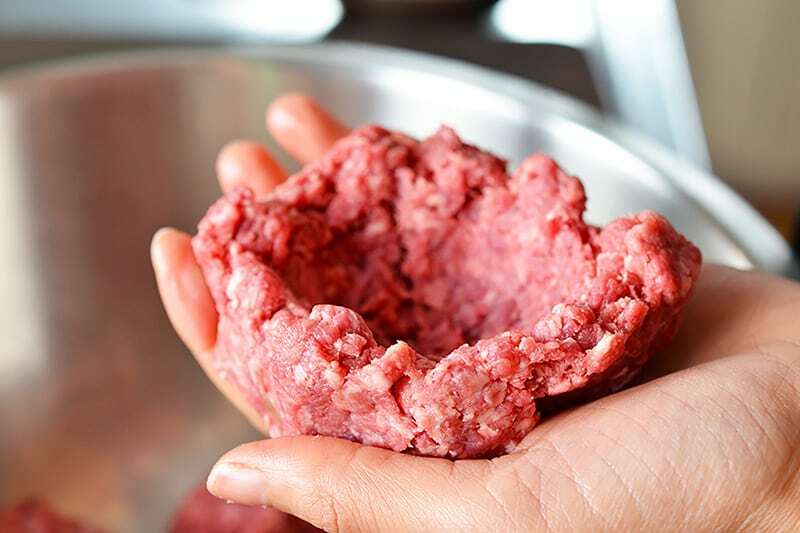 Divide the ground beef into 4 equal portions. Using your fingers, sculpt each portion into a concave bowl. Tuck about a teaspoon of cooked and chilled shallots into each beef bowl. Then, seal up the hole to form a ball. 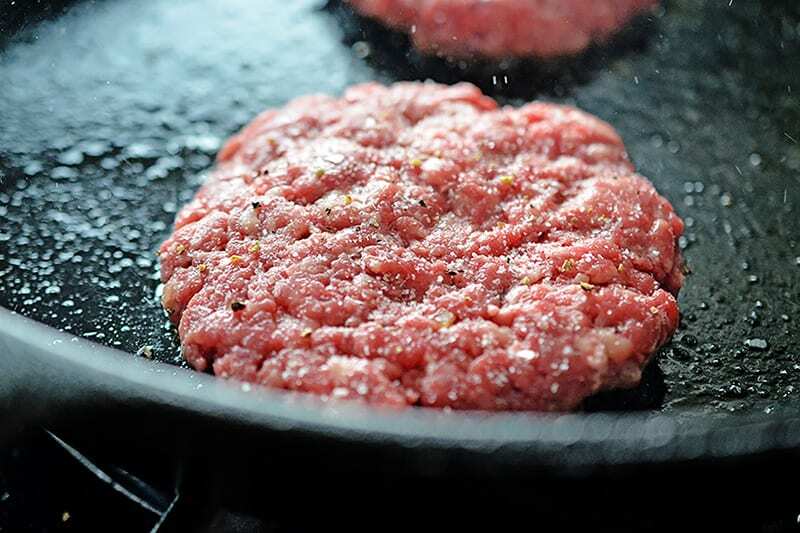 When you are ready to fry the Nomster Burgers, heat a large skillet over medium high heat. Liberally salt and pepper on one side of the patties. Swirl 1 tablespoon of ghee in the pan, once it’s hot. Place two patties seasoned-side down in the pan. Sprinkle salt and pepper on the top of the patties and fry undisturbed for 3 minutes or until a nice crust forms on the bottom. 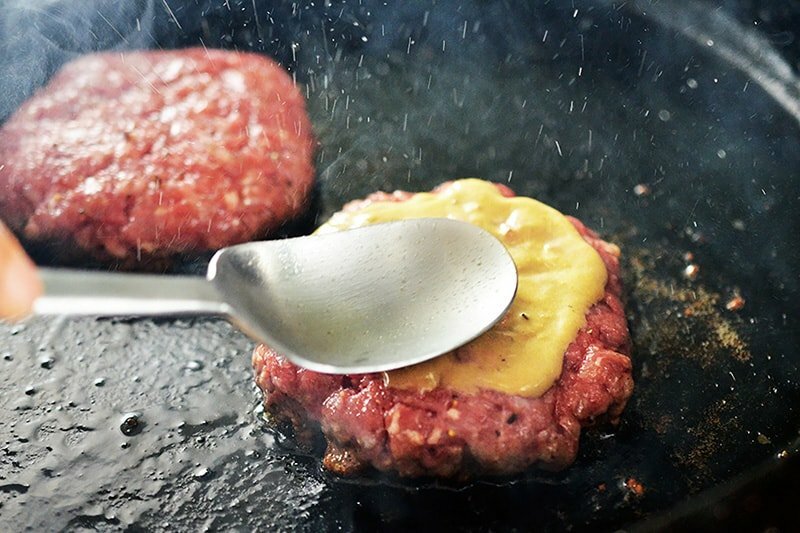 Spread a teaspoon of mustard on the top of each Nomster Burger. Flip the patties over, and cook for another 2 minutes or until the desired doneness is reached. Repeat cooking steps for the remaining two patties. Serve each burger patty with lettuce and tomatoes. 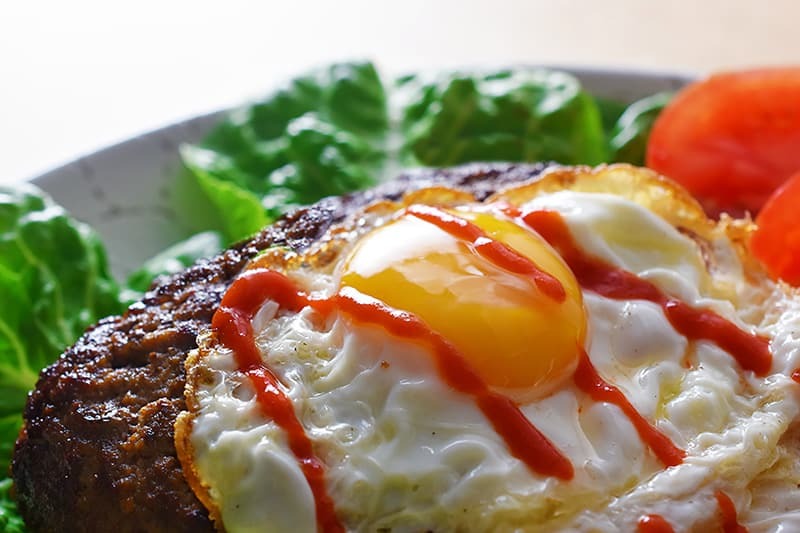 If you’re feeling truly nomstrous, add a crispy fried egg and a generous squirt of sriracha (or ketchup)! If you like this recipe, go buy my latest cookbook, Ready or Not! 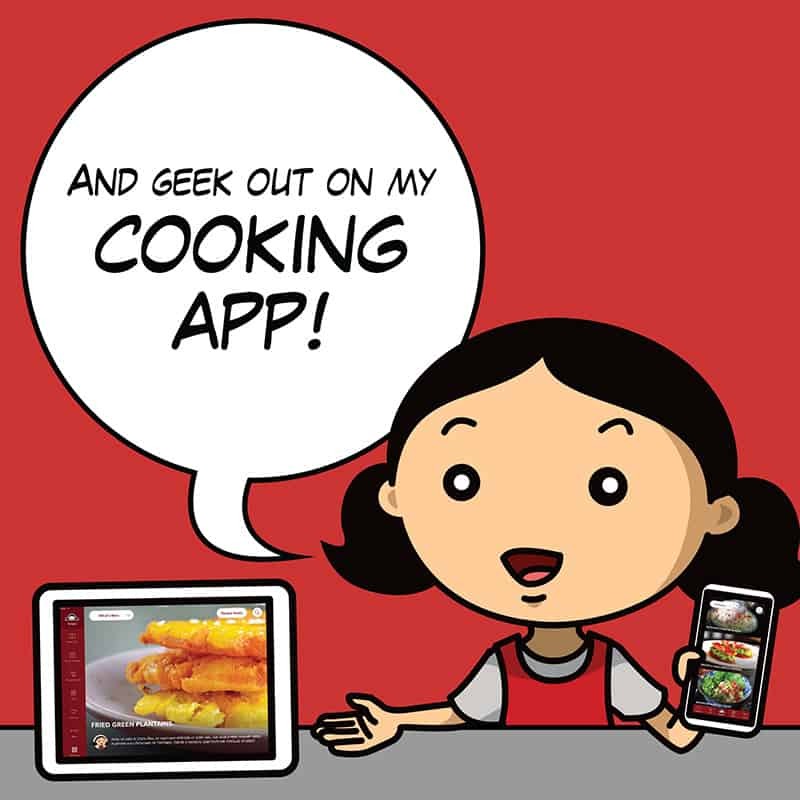 : 150+ Make-Ahead, Make-Over, and Make-Now Recipes By Nom Nom Paleo. In its pages, you’ll find tons of other paleo and Whole30 recipes that’ll scratch that itch for insanely delicious and nourishing meals! Want more inspiration from my past January Whole30s? Check out my Day 5 posts from 2018 and 2016! These Whole30-friendly Nomster Burgers are a healthy makeover of the popular Animal Style burger from In-N-Out’s secret menu item. They’re ready in 30 minutes and you won’t even have to leave your house to satisfy your fast food burger cravings! Tuck about a teaspoon of cooked and chilled shallots into each beef bowl. Then, seal up the hole to form a ball. Swirl 1 tablespoon of ghee in the pan, once it’s hot. Place two patties seasoned-side down in the pan. 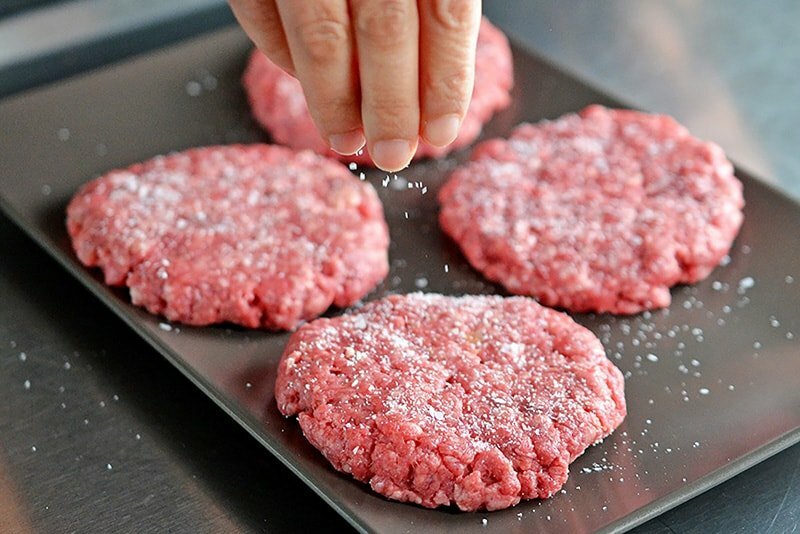 Sprinkle salt and pepper on the top of the patties and fry undisturbed for 3 minutes or until a nice crust forms on the bottom. Spread a teaspoon of mustard on the top of each Nomster burger. Flip the patties over, and cook for another 2 minutes or until the desired doneness is reached. Repeat cooking steps for the remaining two patties.